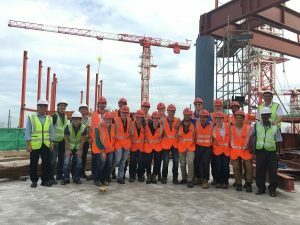 To start the afternoon, the global leaders gang made their way across the city back to Changi Airport to visit the Changi Jewel project site. Upon arrival the team was greeted by Edwin, who is one of the project leads for the architect RSP. We were graciously, ushered into RSP’s project office within the airport where we were introduced to several members of the project’s design and construction teams. The designers of the building are RSP Architects, who designed both the concept for the building and the engineered the structural system. RSP has designed several unique and modern buildings that can be seen across the country of Singapore. The contractor for this project is a joint venture company that is made up of members from both Who Hup and Obyashi. 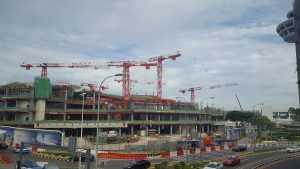 Both are contractors with deep roots to Singapore, with a combined total of more than a century working in the region. 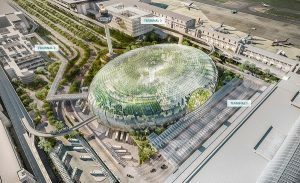 In the team’s presentation we learned that as time has progressed and Singapore has continued to develop, the facilities at the airport have been struggling to meet the demands its increasing number of patrons. 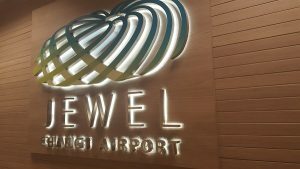 The idea for the Changi Jewel was developed to alleviate the growing pains of the country’s only airport by expanding terminal 1. The Jewel is being built on a parking lot that lies directly south of the terminal to the tune of about 1.5 billion dollars. The Jewel extends five stories into the ground, with basement areas that house shopping facilities and several floors of parking to expand the previously existing lot. To make room for this massive foundation the contractors needed to complete one of the largest excavations that had ever been done in Singapore. To add more difficulty to this feat, the airport required that the team develop a strategy to minimize the loss of ground stability during the excavation. 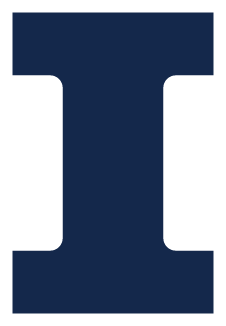 This ultimately led the team to build the massive foundation using the top down construction method. As the foundation of this building comes out of the ground the buildings circular superstructure sits atop its square foundation, requiring that the team design and construct a transfer plate at the top of the basement floor. The superstructure for this building is unlike any other. It is a five level dome shaped building that has a curved glass façade that is supported by a hybrid structural steel and reinforced concrete frame. The exterior of the building is a structural steel frame that wraps the entire building. That sounds simple right? Well, it’s not. The structure that supports the façade is made of steel columns and a structural steel node that connects each member. Because of the curvature and the structural loading of the frame each node is cut using a CNC machine to fit its one unique place in the system. In the whole structure there is 40,000 total pieces of steel with more than 4,000 different and unique nodes. After our introduction to the site the group walked the site with Mr. Gouna from the contractor team and Edwin and several of the other design team members. The superstructure was almost topped out in some regions of the building with the foundation completely finished. We also got to see how the temporary structural steel was assembled to support the frame of the façade. The construction team expects that the structure will be completed mid spring of 2017 with the curtain wall system well under way. Upon the close of the visit the team encouraged us to come back and visit in two years once it is completed. Who knows maybe some of us will be back!